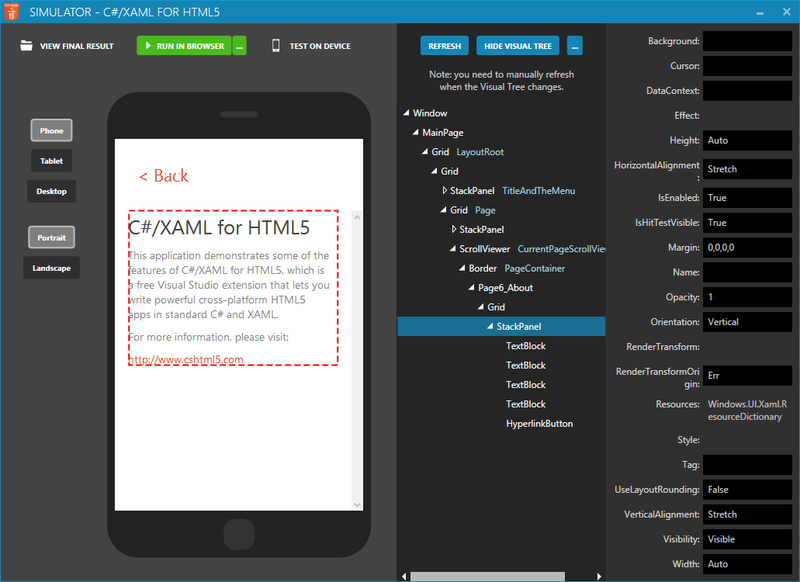 July 25, 2016 — The new beta 9.0 of C#/XAML for HTML5 is available! The free Visual Studio extension that enables developers to create HTML5 apps using only C# and XAML has reached a new milestone. With both bug fixes and new features, this update is recommended to all users. Read below to discover the top 7 new features of this release, or move to the end of the page for the full changelog. 2. XAML Live Inspector - it lets you inspect the visual tree at runtime and view/change UI element properties on the fly! 3. Up to 20x Faster Compilation! 7. Over 40+ other new features and bug fixes, including Chrome for Android support, StopWatch, StrokeDashArray, UpdateSourceTrigger, Easing Functions, Storyboard.Begin(), MessageBoxButton, System.Reflection improvements, non-ASCII characters support in WCF/XmlSerializer strings, and a lot more! The full change log can be found below. Runtime Visual Tree Inspector! (inspired by the amazing work the XAML Spy team) It lets you navigate the UI elements at runtime and even change their properties on the fly! Much, much faster compilation! (up to 20X faster) The simulator will appear after a few seconds. The generation of JS and HTML files will continue in the background. Simulator feature: Ability to choose "Desktop" as a possible choice of "display size", which makes the window much larger and resizable! Simulator feature: The "display size" is persisted, so when you restart the Simulator you get the same display size as before. Removed misleading warning "new protected member declared in sealed class"
Support for Width="Auto" and Height="Auto"
Resource dictionaries without code-behind now have a "public" accessibility rather than "internal"
Elements defined with x:Name now have a "protected" accessibility rather than "private"
Fixed warning "Module ... has no symbols"